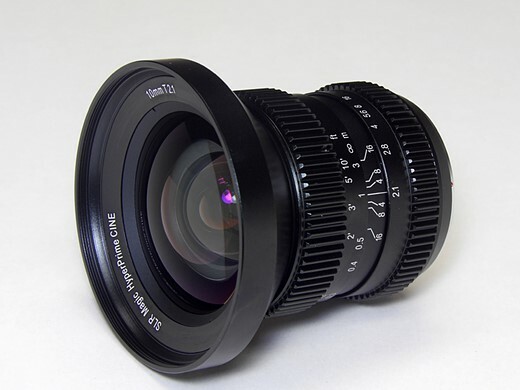 SLR Magic will introduce at Photokina a new HyperPrime lens for Micro Four Thirds, the Cine 10mm T2.1. Equivalent to a 20mm wide angle prime on a Micro Four Thirds camera, the manual focus lens is built with 13 elements in 12 groups, offering a stepless aperture ring for smooth transition of exposure. Also introduced is a variable ND filter, the SLR Magic 77 ND 0.4-ND 1.8. It provides a reduction of 1.3 to 6 stops. The SLR Magic HyperPrime Cine 10mm T2.1 will cost $799/£699 and the 77 ND 0.4-ND 1.8 filter will cost $179/£149; both will be available at the end of October. Hong Kong, China (September 3, 2014) - SLR Magic expands the micro four thirds lens lineup with the new SLR Magic HyperPrime CINE 10mm T2.1 wide angle lens. With this latest addition, the portfolio of lenses for the micro four thirds system is now comprised of thirteen focal lengths. The product will be officially introduced during upcoming Photokina 2014 fair in Cologne. The SLR Magic 77 ND 0.4-ND 1.8 filter is a solid variable neutral density filter providing a reduction of about 1.3 to 6 stops. The 0.4 to 1.8 density creates a darkening of the entire image, allowing you to photograph with a wider aperture or slower shutter speed than normally required. The degree of density is easily controlled by rotating the front filter ring via the non-removable lever. By slowing your exposure time you are able to control depth of field and convey movement more easily. Both filter substrates are combined into one filter ring, this filter is low profile and helps to eliminate vignetting on most lenses. 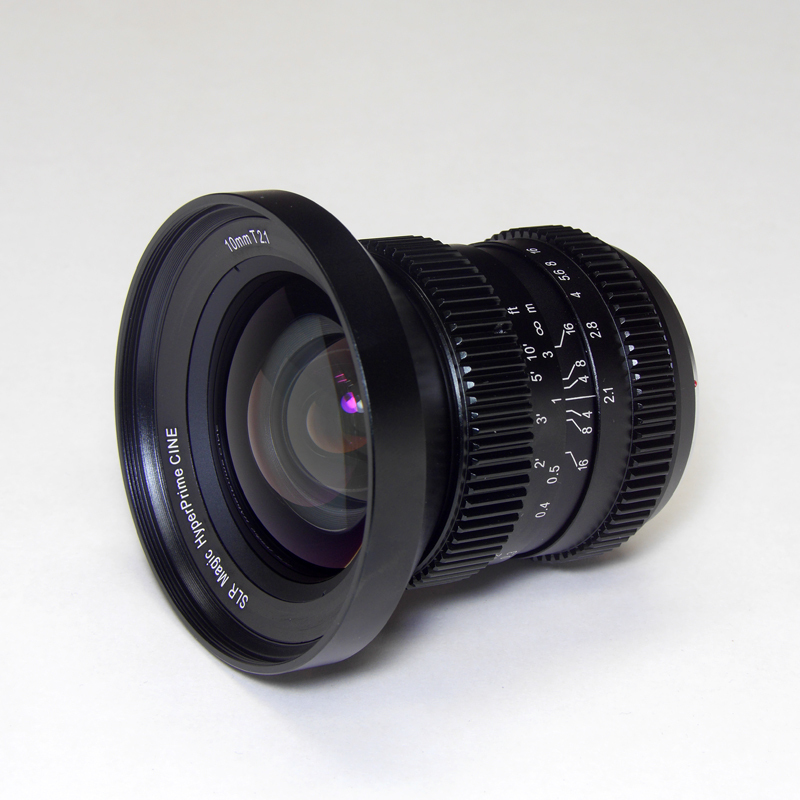 The front filter ring diameter is 86mm in diameter, further helping to reduce vignetting, on wide angles lenses such as the SLR Magic HyperPrime CINE 10mm T2.1 lens. The SLR Magic HyperPrime CINE 10mm T2.1 (MSRP: $799 US) and SLR Magic 77 ND 0.4-ND 1.8 filter (MSRP: $179 US) will be available from authorized SLR Magic dealers starting end of October 2014. Send an email to support@slrmagic.com with the subject "SLR Magic 10mm T2.1 volunteer". Filter Mount: Internal thread for 77mm filter; filter mount does not rotate. Any ideas who might actually be making this lens? Seems like a nice addition for film makers specifically. I don't often shoot that wide myself but nice to have that option. They've been selling chinese CCTV lenses with big markup.. so one may guess. Some of their lenses look well made and a picture on their website one had made in Japan stamped on it. Was just wondering if they contract designs to another maker or are actually a manufacturer themselves. This seems to be a good fit for the Blackmagic PCC. Nice addition to the M4/3 system! I want a pony that shites diamonds and pieces fine scotch. I see the superiority complex gear heads have poked their horns in. It should be f.95 at a quarter the cost and quarter the size. I fart in your general direction if you are less than a 35mm sensor size devotee. All worship "FF" and the virgin Leica from whom gave birth to our lord DOF control. Throw some APSC sensor owners in the volcano to appease our gods anger of those who blaspheme his sensor size. Lay waste to any M43 user and take 1" users as slaves and concubines. I'm very interested in night sky photography with this lens. So basically equivalent to MF 20mm f5.6 for FF? 2.1 is about (not exactly) 1/8th stop slower than 2.0. If t2.1 is in this case f2.8 (almost a full stop of transmission), then yes. The FF equivalent would be a 20mm t4.36. It's likely to be the opposite, no less wide than f/2. In any case, cinematographers are unlikely to be interested in DoF/diffraction-equivalence. For them it's about exposure. And if you think of exposure in equivalent T-stops, you need to use "equivalent ISO" as well for it to make sense. You guys are doing these calculations backwards... T2.1 is probably F1.9 or less. Okay then it should be close to 20mm f3.5 then. No, the FF equivalent would be f1.05... its narrower. T stands for transmission and takes into account any light absorbed or scattered by the elements of a lens, so it depends on the lens. This is the reason there is no precise 'formula' to convert F stops to T stops and vice verse, as different lens designs require different amounts of compensation. The Majority of of Cin lenses that are calibrated and marked for both always have a T number that is lower than its corresponding F number. I have never seen or heard of a lens whose related F & T numbers were the reverse. Nonsensical. You don't expect shallow depth of field with a 10mm lens (or 20 mm for 35mm frame only idiots) so that BS of multiplying the T-stop or F-stop has no validity. This is a t-stop rated lens because accurate exposure is more important than depth of field in the video work for which this lens is intended. @namssurt: You would wonder how shallow a 24 f1.4 on fullframe can be... but you won't recognize it as MFT only idiot (just to reply in your words). T-Stop can vary a lot from f-stop, for example on the Minolta (Sony) AF 135mm 1:2.8 [T4.5] SFT. Multiplying f-stop/t-stop is correct, if you can use it for your own work is something different. Most people can do their pictures with a iPhone, anyway. I found this to be really interesting. Are there any more sources on this? I would like to know more about this. Not if you shoot Academy ratio, but yeah, for cinema-work it'll probably be used together with something like SLR Magic's anamorphic adapter to get the 2.39:1 ratio needed. You had me until "Manual Focus". Manual Focus would be great for the interior architecture shots that this lens was intended for. However, I need it for low light action shots which really require good AFF. Depends on how good your manual skills are. You wanna go out and shoot some bats in flight? Have a look at the lens body. Where on earth would there be a space left for an AF drive? Since m4/3 doesn't give too much DOF control, and given it's a wide lens, you can close it to f/8 and get great shots if you predict the distance your subjects will be at. The type of video work this lens is aimed at pretty much demands MF, which is why the focus ring is geared to accept a follow focus mechanism. For interior shots, you don't need fast aperture, you need cheaper 9-18 and a tripod. How many cine lenses do you know that offer AF? How many video shooters use AF? "How many video shooters use AF?" Everyone who has tried the GH4 and wants to shoot AF. Hyperfocal? 10 f/2 on mft has hyperfocal of 10 ft, with near limit of 5.23 ft. Now try to shoot, say, a bathroom for a real estate listing, from a corner. You'll need both a wider lens and a smaller aperture. And electronic contacts to tell the camera the current FL if you want to save time and shoot without a tripod or extra light with a camera with IBIS (which is totally possible with Oly 3-axis or 5-axis systems). Lens FL for IBIS is set Manually in the camera... or did you not know that ? I know that and do that regularly, but for zooms it is hell, and even for primes I waste a few extra seconds every time I change lenses.
" However, I need it for low light action shots which really require good AFF." so are they going to just re-badge the whole Sony lineup?